Jackson Pollock was born in Cody, Wyoming in 1912. His father, LeRoy Pollock was a farmer and later a land surveyor for the government. 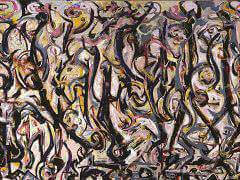 Jackson Pollock grew up in Arizona and Chico, California. During his early life, Pollock experienced Native American culture while on surveying trips with his father. Although he never admitted an intentional imitation or following of Native American art, Jackson Pollock did concede that any similarities were probably a result of his "early memories and enthusiasms." In 1929, Jackson Pollock studied at the Students' League in New York under regionalist painter, Thomas Hart Benton. During early 1930s, he worked in the Regionalist style, and was also influenced by Mexican muralist painter such as Digo Rivera, as well as by certain aspects of Surrealism - a 20th-century literary and artistic movement that attempts to express the workings of the subconscious by fantastic imagery and incongruous juxtaposition of subject matter. In November 1939, The Museum of Modern Art in New York City mounted an important Picasso exhibition entitled: Picasso: 40 Years of His Art, which contained 344 works of Pablo Picasso and his famous anti-war mural, Guernica. The exhibit led Pollock to recognize the expressive power of European modernism, which he had previously rejected in favor of American art. 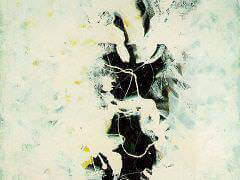 He began to forge a new style of semi-abstract totemic compositions, refined through obsessive reworking. In the decades following World War II, a new artistic vanguard emerged, particularly in New York, that introduced radical new directions in art. The war and its aftermath were at the underpinnings of the movement that became known as Abstract Expressionism. 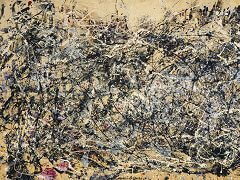 Jackson Pollock, among other Abstract Expressionists, anxiously aware of human irrationality and vulnerability, expressed their concerns in an abstract art that chronicled the ardor and exigencies of modern life. By the mid 1940s, Jackson Pollock introduced his famous 'drip paintings', which represent one of the most original bodies of work of the century, and forever altered the course of American art. At times the new art forms could suggest the life-force in nature itself, at others they could evoke man's entrapment - in the body, in the anxious mind, and in the newly frightening modern world. To produce in Jackson Pollock's 'action painting', most of his canvases were either set on the floor, or laid out against a wall, rather than being fixed to an easel. 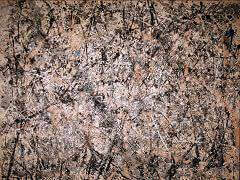 From there, Jackson Pollock used a style where he would allow the paint to drip from the paint can. Instead of using the traditional paint brush, he would add depth to his images using knives, trowels, or sticks. This form of painting, had similar ties to the Surreal movement, in that it had a direct relation to the artist's emotions, expression, and mood, and showcased their feeling behind the pieces they designed. There was a reviewer a while back who wrote that my pictures didn't have any beginning or any end. He didn't mean it as a compliment, but it was." 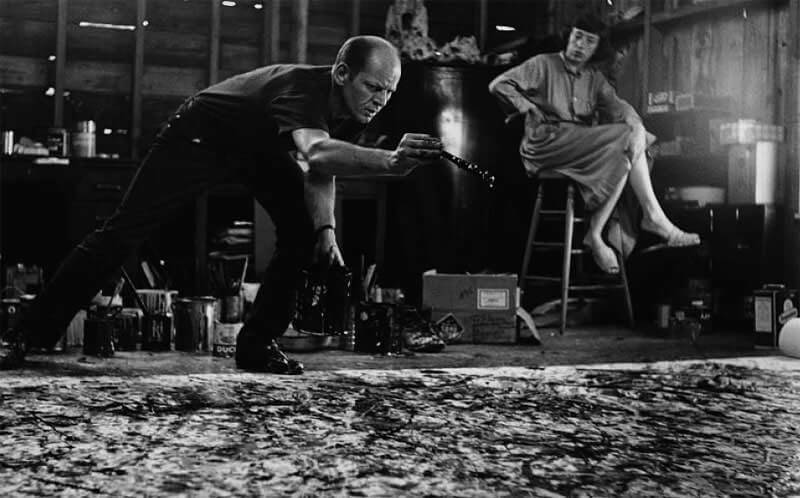 In addition to the 'drip and splash' style, the All-over method of painting, is also one which is tied to Jackson Pollock, and many of the artworks he created. This art form avoids any clear and distinct points of emphasis, or any identifiable parts within the canvas being used to create the piece. The designs and images which were created using this style of painting, really had no relation to the size of the canvas that was worked on; the lack of dimensions, and disregard for size of the drawings, were some unique features which this form of art captured. Many of the pieces which Jackson Pollock created following this style, required him to trim or crop the canvas, in order for the image to fit in, and to work with the overall features of the art. Pollock's radical methods and growing reputation quickly caught the attention of the mass media. In August 1949, Life magazine ran a feature story posing the question: "Jackson Pollock: Is he the greatest living painter in the United States?" The text was alternately mocking and respectful. In 1951, at the height of the artist's career, Vogue magazine published fashion photographs by Cecil Beaton of models posing in front of Pollock's drip paintings. Although this commercial recognition signaled public acceptance - and was symptomatic of mass culture's inevitable expropriation of the avant-garde - Pollock continuously questioned the direction and reception of his art. 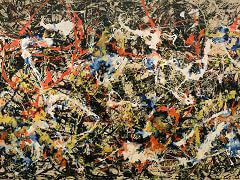 At the peak of his fame, Pollock abruptly abandoned the drip style. 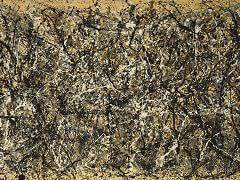 Pollock's work after 1951 was darker in color, including a collection painted in black on unprimed canvases. These paintings have been referred to as his 'Black pourings' and when he exhibited them at the Betty Parsons Gallery in New York, none of them sold. 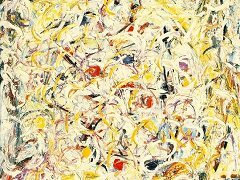 But later Pollock moved to a more commercial gallery by returning to using color and figurative elements. In 1960s, Jackson Pollock was viewed as one of the most important figures in the art world, and one of the innovators of the avant-garde styles that were beginning to emerge. 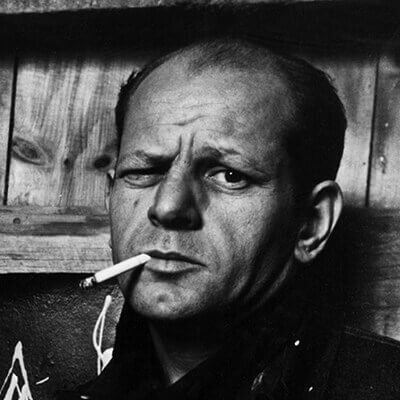 Like many other famous figures, the issues which Jackson Pollock suffered from in his personal life, such as his strife with alcoholism, added to his "superstar" status. And, his premature death, which took place when he was killed in a car crash, also added to the legendary status which he is still known from in the art world today. 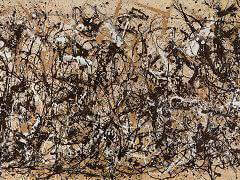 To this day Jackson Pollock is known as a leader in the most important 20th century American art movements. The risks and the creative approaches he took, led future artists to create with passion, as opposed to trying to follow set boundaries or guidelines. In addition, Pollock's radical paintings and dramatic persona helped draw attention to the broader group of Abstract Expressionists, including Willem de Kooning, Arshile Gorky, Robert Motherwell, Barnett Newman, and Mark Rothko. Painting is self-discovery. Every good artist paints what he is." Just like William Shakespeare on literature, and Sigmund Freud on psychology, Jackson Pollock's influence on American art is tremendous. Jackson Pollock made it possible for American painting to compete with European modernism by applying modernism's logic to new problem. He created a new scale, a new definition of surface and touch, a new syntax of relationships among space, pigment, edge, and drawing, displacing hierarchies with an unprecedented and powerful and fabulously intricate self-generating structure. Although actively engaged throughout his life in a serious dialogue with the history of world art which ranged from Paleolithic and Indian art to Renaissance art masters Michelangelo, Leonardo da Vinci; from Mexican muralists to the Surrealists Salvador Dali, Joan Miro, and Max Ernst - Pollock's aspirations always remained courageously and even chauvinistically of this continent. Pollock's defiant refusal to stay within traditional bounds, violence, exasperation and stridency, all were paradigmatically New World. At a time - and in a guise that absolutely nobody expected - these were the unlikely characteristics that finally came together to produce an American Prometheus.